As one very smart T.V. show (read: The West Wing) once said, “Decisions are made by those who show up,” and if there is one thing I have learned this summer, it is that there sure are a lot of things to show up to. My job, however, was not just to show up, but to make something to show up to. My name is Andy Burnstein. I am a rising junior at Whitman majoring in History, who hopes to spend his career preventing people from repeating history’s worst episodes by engaging people in the political process. This summer, I have interned at Fuse Washington in Seattle, a progressive non-profit focused on democratic engagement and issue-based organizing in Washington State. For several months now, I have created volunteer opportunities for just some of Fuse’s 100,000 members. For the most part, those opportunities have been voter registration events. From King to Kittitas County, Fuse volunteers have swept through farmer’s markets, food banks, libraries, festivals, and public concerts and movies in an attempt to get people to engage in our democracy. Our goal has been to register demographics that are the most likely to be under-registered: young people, low-income people, and people of color. I believe—as many of our volunteers do—that a vote can be a route to empowerment for historically disenfranchised peoples and a check against oppressive forces. Fuse has registered close to 2,000 new voters in 2018, and I have helped mobilize volunteers to contribute to some of that number. But it has not been easy. The truth is, voter registration is hard work. The response rate is—by the nature of the work—low; if you register one person in an hour of volunteering, you’re doing well. Most people are of course already registered, which is not a bad problem to have, but when you’re a volunteer and you put in an hour of work to get one registration, you can feel defeated. My job has been to keep our volunteers happy and motivated. I had to get to know them, give them resources (forms, clipboards, etc. ), train them and do roleplay with them, brief them on potentially confusing scenarios (e.g., what if someone is a minor now but will be 18 by the next election? What if someone is a felon but off parole, what if someone is homeless? etc. ), give them snacks, and make them want to come back for more. These photos really represent a culmination of all my work thus far at Fuse. 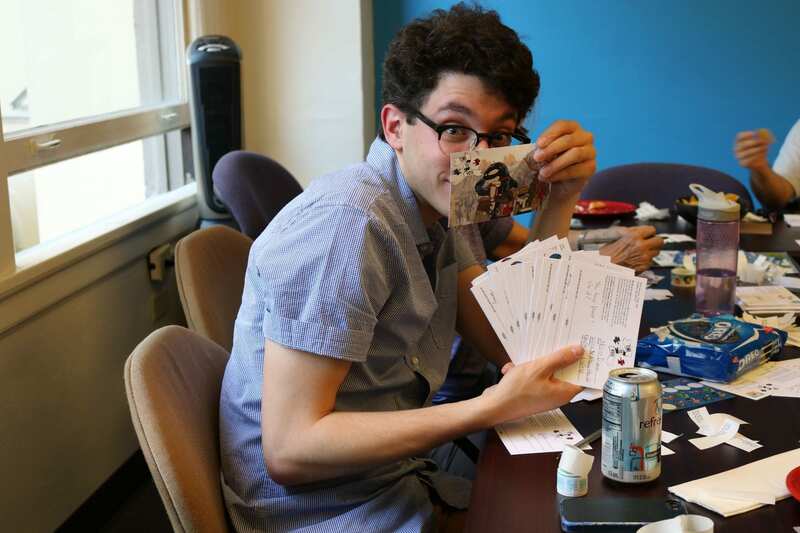 These moments were captured at a postcard party my supervisor and I organized. 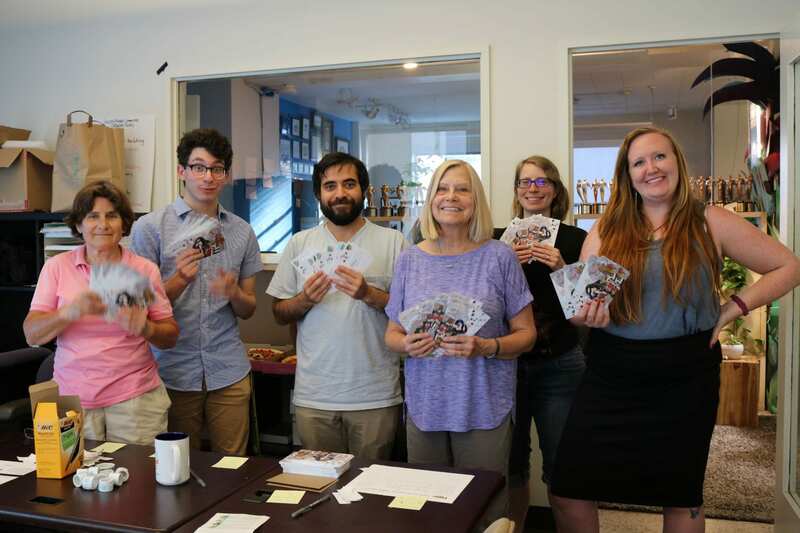 Together with volunteers, we sent personalized postcards to nearly 2,000 new voters Fuse had registered this summer, reminding those new voters to vote. Finding volunteers was simple; we used a program called “Relay” to send out a mass text to our membership based in the Seattle area, and the postcards were provided by Fuse’s extremely talented graphic designer and a printing company in the Seattle area. After a thrilling saga of trips to the U.S. Post Office Annex in Seattle’s Sodo district, we tracked down 2,000 postcard stamps. Finally, over several hours (and with the help of several large Pagliacci pizzas and lots of La Croix), Fuse staff and volunteers made sure that 2,000 people were going to make our democracy just a little more active. This is just one event that people can show up to to improve our democracy, but I hope to create many more events where future volunteers can do the same. Luckily for me, this internship with Fuse has given me the tools and knowledge necessary to get started.